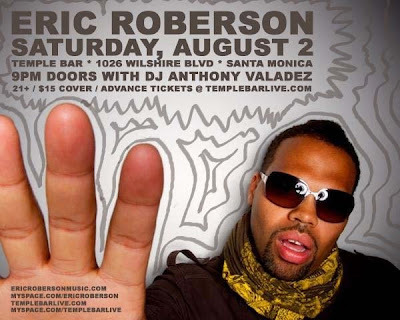 One of Creatiff Chatter's favorite independent artist, Eric Roberson hits the L.A. area with his hot band, Franklin Bridge this Saturday, Aug. 2. If you're in L.A., or near the area, you gotta check him out. Eric is a part of the puzzle that's missing from R&B music. Let's put the pieces back together. Your soul will appreciate you! For the LA folks who went to the Grammy Edition of Kiss n' Grind and only got to hear E do a couple of songs, this is a FULL Eric Roberson show. His band... showing o-u-t!